Detroit – New Center’s most famous building is paying homage to the rest of Detroit. 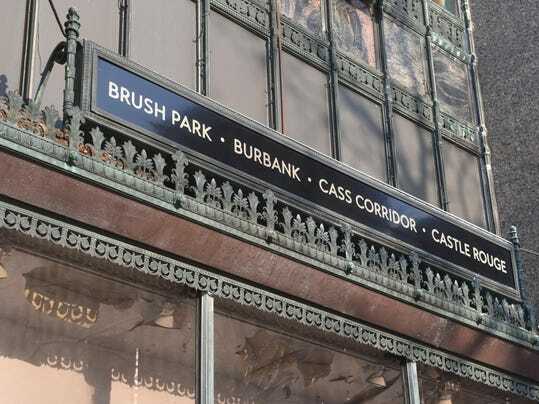 The names of Detroit’s 105 neighborhoods have been embossed on brass signs around the building’s base to celebrate people and places across the city’s 139 square miles. “Signs of Times” is the third addition to the Fisher Beacon Project completed by The Platform, a real estate developer promoting the resurgence of Detroit neighborhoods. The first was “Maker City,” a photographic tribute celebrating Detroit’s makers and innovators in November 2016, and the second was the Fisher Halfpipe that was installed in the skyscraper’s lobby in April for four days of stunts by skateboarders and rollerbladers. The Fisher Building also will open a maker space collective shop in the coming months in its concourse. MKR Underground will be an extension of MKR City, a company that produces an app connecting innovators seeking to enhance communities. The shop will bring in a dozen artists, designers and artisans from all over Detroit to sell their locally produced work. The initiative comes after The Platform converted the fourth floor of the Fisher Building into design studios for artists at subsidized rates in August. The Fisher Building, known as “Detroit’s largest art object,” was built by the seven brothers who founded the Fisher Body Company and opened on Sept. 1, 1928. Designed by Albert Kahn, the 441-foot tower was once known as the Cathedral to Commerce and is home to WJR Radio, the Fisher Theatre and Club House Tavern. The Underground makers will join shops already there, including The Peacock Room, Yama, Stella, Detroit Gallery of Contemporary Crafts and a new floral shop, Pot and Box. Detroiters are invited to take selfies in front of their neighborhood sign and represent their community by sharing on social media with the hashtag #MyDetroitNeighborhood.